Trouble hearing tv? A center channel can help! We've all experienced it at one time or another. You are watching an absorbing movie on your new flat-screen TV at home and a line of dialogue from an actor will zip by either garbled or too quiet for us to understand. You replay the scene from your DVR or disc, turn up the volume to try hearing the TV dialogue, and it's still too garbled to comprehend. It's a common scenario. With the move to streamlined flat-screen TVs, the space inside the set is miniscule compared to the big old CRT picture-tube sets, or large DLP/LCD rear-projection sets of years past, so new flat-screen TV's own speakers must by design be tiny. In the search for ever-thinner LCD or plasma displays, engineers have to use smaller and smaller speakers, whose output and frequency response is severely limited. Music and dialogue sound tinny, lacking clarity and devoid of any bass. Turning the volume up won't help in deciphering and hearing TV dialogue. The tiny cones of the speakers simply can't move any more to create louder sound—they just distort, which worsens intelligibility. 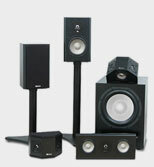 The answer to hearing TV dialogue from your luxurious flat-screen is to simply install a separate center-channel speaker to handle the movie dialogue and a small home theater surround system with a modest AV receiver/amplifier to power the center channel and left-right front speakers and surrounds for a more 3-dimension experience. 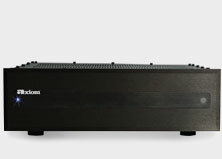 And here's the huge benefit: using a dedicated center channel speaker with even an entry-level AV receiver lets you adjust the loudness of the actor's dialogue independent of the other speakers. So you can raise the volume of the dialogue over that of the background surround special effects and music, which sometimes may obscure the actor's speech. The Axiom In-Wall On-Wall VP150 Center Channel. Movie theater exhibitors have known this for years. That's why even early cinema surround sound systems always anchored the dialogue for movies to a big horn speaker centered behind the movie screen, designed to project clear dialogue to hundreds of audience members in the same way we cup our hands around our mouths to shout and make our voices maximally audible and clear. 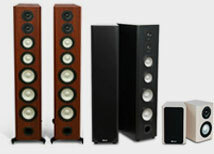 Many center-channel speakers are dedicated horizontal designs, like Axiom's VP100, VP150, and VP180, with the woofers and tweeter(s) arranged in a horizontal array so the speaker can be easily placed on a shelf, in an equipment cabinet above or below your flat-screen display, or wall-mounted with a tilting bracket so you can aim the center speaker directly towards your seating area. But you don't have to limit yourself to a horizontal center for hearing your TV. 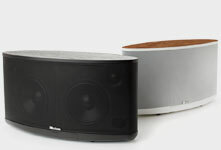 If you have room for a good upright bookshelf speaker like the Axiom M2 or M3, it will work just fine as a center. Once installed, you'll be amazed at the improvement in movie dialogue clarity with a good center-channel speaker as well as the added benefits of much better sound quality for all kinds of music from TV shows and DVD/Blu-ray discs.